Sun Studio in Memphis, Tennessee, is simply one of those places that’s reached a sort of legendary or mythical status. For people who love music, especially music of the mid 20th century, seeing Sun Studio in person must surely be something of a musical pilgrimage. Sun Studio opened its doors in January of 1950 at 706 Union Avenue in Memphis, Tennessee. It was initially known as the Memphis Recording Studio but shared the building with Sun Records. What would become known in due time as Sun Studio is credited with the first rock and roll recording. Jackie Brenston and his Delta Cats recorded that single – “Rocket 88” in 1951. It was a place that over the next two decades saw the likes of Elvis Presley, Johnny Cash, Carl Perkins, Roy Orbison, Charlie Feathers, Ray Harris, Warren Smith, Charlie Rich, and Jerry Lee Lewis. And it wasn’t just Rock music. Country, R&B, and Blues greats also cut records at Sun Studio in those golden years of music in the mid 20th century. Sam Phillips sold the record label in 1969 and the studio was closed for a number of years but never forgotten. Sun Studio was later re-born and today’s artists have recorded under the same roof as the legends of the past. And Sun Studio has become something of a mecca for people visiting musical Memphis today. I wanted to capture that feeling of the building as an iconic part of the history of modern music. It’s a building that’s more that the sum of its bricks and mortar. It’s the history that happened here, the great musical artists that created here. 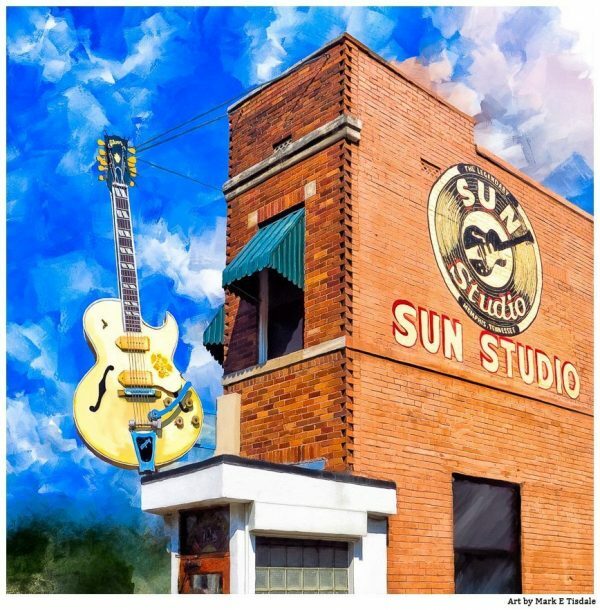 Have you visited Sun Studio perhaps? Or maybe you’re looking for a gift for a friend that loves the music that was recorded there? Maybe you have a wall of classic LP record albums on display that would work well with this square format artwork? Whatever your thoughts I’d love to hear what attracted you to this particular piece of Memphis art!